Saturday 1 December: we lost 1-4 to CFB Ladies during game 4 so it was going to be interesting to see how much progress we had made since then. Could we possibly manage to turn the result around into a second win in such a short period of time? Uncharacteristically we got off to a very nervous and shaky start and could easily have been 2 goals down after 5 minutes – but “guess who” once more came to our rescue? None other than Francisco “nothing-goes-past-me-frango” Burnay, with another brilliant display from beginning to end (nota bem mum & dad, he’s earning himself a great present for Xmas….!). The “boat” steadied and from then on the game was very tight with neither side dominating and chances occurring at both ends, with João B going close to scoring on several occasions. Eventually late in the second half CFB scored from loose marking and again in the last seconds of the game. Overall, a major improvement on game 4. Good performances all round, in particular with Maggie and Ben both starting to demonstrate sound techniques from training and tireless work from the “central engine room” by Pedro L who provided the opponents with lots of headaches! This entry was posted in U15 on 05/12/2017 by Joao Miguel Freitas. The U15 had their second game of the season against a very experienced CFB and again performed well. Whilst most of the CFB team (including their key players) will be too old for U15 next year, ALL of our team will be eligible demonstrating the youth and potential we have!! We did not have a goalkeeper and still need to identify somebody for the future (please everyone, help us find a new candidate ?) and this inevitably impacted on the result, but the team fought a spirited battle to the end and it is clear we are making progress. Well done guys & gals! This entry was posted in U15 on 08/11/2017 by Joao Miguel Freitas. 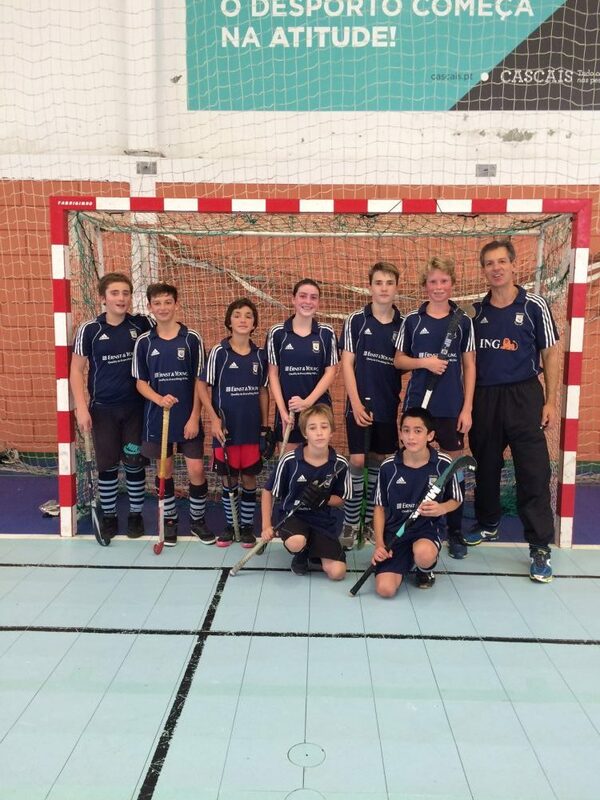 The U15 team is very young (3 out of 8 are U13), inexperienced (2 have only just started playing hockey for the first time ever) and they have had very few practices together since the season started so we needed to be a bit realistic in our first game against a very strong CPAC team (the reining National and Regional champions!). The coach made three main pre-game requests of all the players – to have fun; to give 100% effort and to ignore the score result. All in all it was a superb performance, both individually and collectively, and way exceeded expectations. After 10 minutes (out of 40) the score was justifiably still 0-0 and CPAC looked rather surprised! The best goal came in the second half with a brilliant finish into the top of the net by Rodolphe (wow, if he can just find the right net next time then we will crush our opponents !). I can rarely recall a game where every player gave +100% effort (I can prove this from the shirts which were all completely drenched and “smelly” – don’t worry, already washed and perfumed! ), and fought like lions right to the very end. So we have lots of potential and lots to work on but if we can maintain this trajectory and dedication then we will make great progress by the end of this season! I would like to especially thank Francisco for offering to do GK duties without any prior practice – it is a very difficult task and he is a talented outfielder who we really need to play out of goal. I would like to ask everyone to think long and hard if they can help us find someone (11-14 yrs old) who might be interested in trying out being a GK, perhaps a footballer who would like to be in goal but doesn’t have an opportunity? Lastly, a special thank you to all our supporters and wonderful parents whose off field support is so essential – we really appreciate you (don’t we kids!!!!!!). This entry was posted in U15 on 21/10/2017 by Joao Miguel Freitas. This Saturday two games were played, both resulted in heavy defeats. S15 lost by 19-0 against a strong team of Clube Futebol Benfica. The men moved to st. Maria da Feira to face the C.F.U.Lamas and they left with a defeat by 11-1. The experience spoke louder and it was not possible to do more, this was, so far the worst game that the LC played, not for the result but for the lack of concentration and low level of hockey that until then had been quite good. This entry was posted in Men, U15 on 30/10/2016 by Joao Miguel Freitas.